Kirk McElhinney is a passionate singer/song writer whose soulful voice and insightful lyrics which together with a rich and vibrant mosaic of acoustic guitar picking give him a sound that is both unique and enticing. His concerts are always something of a one-off, due to his free-spirited jamming style and raw energy which captivates audiences everywhere he performs. 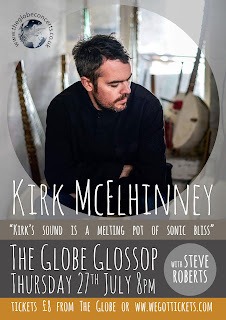 Kirk has appeared alongside such luminaries as folk legend Bert Jansch, Tommy Emmanuel, Nick Harper, Katherine Williams, Wizz Jones and Nitin Sawhney who described Kirk's sound as "…a melting pot of sonic bliss".